This species is accepted, and its native range is NE. Tropical Africa, Central Asia to Korea. Biennial herb 0·5–1 m. tall; stems shortly stellate-pilose. Leaf-lamina 4–11 cm. in diam., of basal leaves reniform, of cauline leaves suborbicular and 5-lobed with rounded lobes on lower ones and those of upper ones triangular, margin crenulate-dentate; petiole 4–8 cm. long, longitudinally sulcate, glabrescent except that the grooves remain tomentose; stipules ovate-lanceolate. Flowers in fascicles; pedicels unequal, the longest up to about 3 cm., shortly stellate-pilose. Bracts of epicalyx 5–6 mm. long, linear, ciliate. Calyx somewhat inflated, sparsely stellate-hirsute; lobes triangular, acute. Petals about twice as long as the calyx; claw glabrous or with a few weak hairs. Staminal tube setose in upper portion. Mericarps 10–12, dorsally smooth or faintly rugose, rugose along the rounded angles, flabellately striate on the flat lateral sides. Annual or biennial herb 0.5–2.4 m tall, erect, decumbent or ascending, pubescent. This must have been widespread at an early date – already in West Uganda during last decade of 19th Century. It penetrates right into alpine zone e.g. Hedberg 894 from northern slope of Koitobos, Mt Elgon. Has been used as a pot herb and vegetable. Grimshaw 93757 (West Kilimanjaro, 24 Sep. 1993) is a distinctive form with pubescent mericarps and Hepper & Jaeger 7049 (Mt Kulal, Gatab, 24 Nov. 1978) appears to be the same and also probably Bally 5555 (also from Mt Kulal in forest glade near waterhole at 1905 m, 9 Oct. 1947). 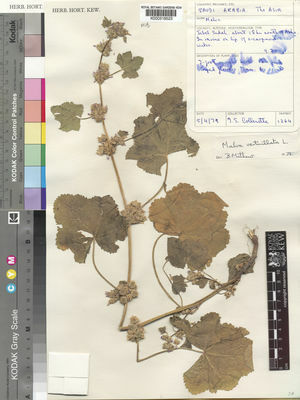 Bally had named his plant M. verticillata; Gillett had named it M. parviflora, Abedin cf. M. rotundifolia and Krebs cf. pusilla demonstrating how difficult these weedy Malva’s are. The mericarps of Bally 5555 are not rounded at the edges. More extensive and better material with corollas and fruits may solve the true identity of these plants. M. neglecta Walls. has mericarps dorsally ± smooth and pubescent but is much less robust with much more slender stems. U.K.W.F., ed. 2: 102, t. 29 (1994).